I was down in Melaka today (or what I prefer to call Malacca which I find more romantic) for work. While driving around and being disappointed with the famous chicken rice ball brunch, I came upon the new Aeon Jusco Bandaraya Melaka mall. Being a bit of a mall rat (and still hungry) we dropped by to enjoy the air conditioning and to grab a bite. After a bite, and knowing full well that I wouldn’t shop on impulse on an empty stomach, I took a walk around the mall. For anyone wondering, I was quite impressed by the new Aeon Jusco Bandaraya Melaka mall. Its large, bright, sleek and spanking new yet well tenanted. There are the usual fast food restaurants as well as one or two more interesting eating places. The anchor tenant is, of course Jusco. But there are lots of other clothing, IT and beauty shops (which I’m sure you are more interested in 😉 ). So anyway, as any good intrepid beauty blogger does, I popped into Sasa (because I wanted to check out the new Kate eyeshadow palette which isn’t in yet) to take a look see. The store is new so everything looks so neat and pristine in there. The SA was a little clingy but I managed to evade her intense attentions 😛 That’s when I spotted Prestige. Here is the information I found online. I took a couple of swipes of the testers. The Sun Baked Mineral Blush is about RM65 and looks pretty good. 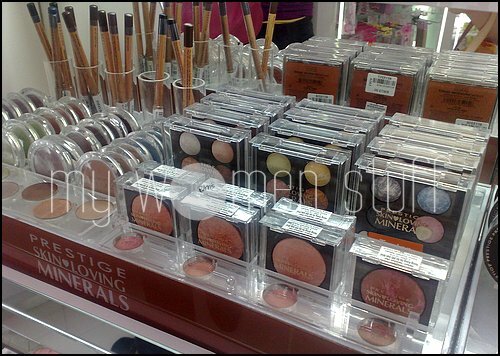 However, it reminded me of the Revlon Mineral blushes – except the Prestige ones look a bit prettier. A bit too pricey for my liking though. 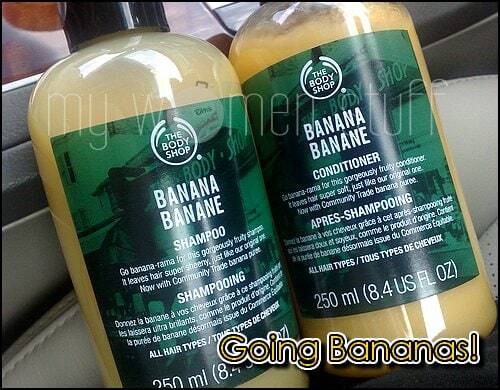 Yes after reading so many people raving about the Original The Body Shop Banana shampoo and conditioner, I got myself a set. Just in time. My Kiehl’s Sunflower shampoo is on its way out. So I’m going from being all peachy to going bananas. PREVIOUS POST: Urban Decay Primer Potion : Is it a genie in a bottle and a Hall of Fame product? NEXT POST: Skincare and Cosmetics : A dupe or just duped? Wow, I didn’t know Melacca had such a nice mall! And yes, I believe Sasa has been carrying Prestige mineral makeup for a while. I bought the mineral powder foundation but it oxidised on me. I popped into TBS over the weekend and did not get the shampoo (smells a lot sweeter than what I remembered) but I did return with the Passionfruit cleansing gel 😀 Let us know if the banana set works for you! Haha Malacca is really forward in many ways 🙂 Its great that people in Malacca now have a place where they can find all the good stuff at one go! oh. I have been there for few times, the shops are well-organized. (Btw, I’m from Malacca :D). I’ve been using the Mineral Powder Foundation and Blush from Prestige, and I love them both! And good on ya for going bananas! May i know, where can i buy the 2p Pearl Brightening Balm ( Sa Sa Product ) ? I’ve never come across this, but if its by Sasa you might want to look at your nearest Sasa store.